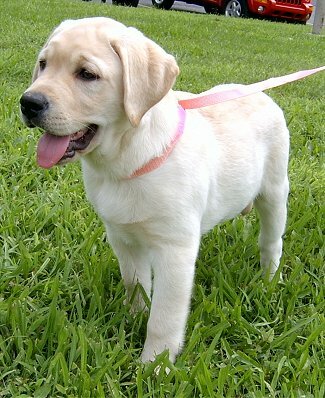 i need to name my new lab pup.....help me!! It is important to name him young, so that he adjusts to his name. However, you need to find something that fits his personaility! A lazy couch dog is not "Hunter", just as "Thor" is not a tiny little dog. If you get to the point where you're starting to train him and no name has popped into your mind as adequate, I would try foreign words. For example, "Lykoi" is greek for "wolf" "Vrai" is French for "True" I named a couple of large huskies after mountains (Teton and Brooks). Go for something shorter, no longer than two syllables...try yelling it, as if you were calling him. Nothing awkward or bumbly. Congrats on the pup, and good luck!